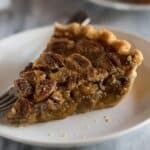 This easy Pecan Pie Recipe is so delicious it will convert even the biggest skeptics! The caramel-like pie filling makes this pie one of my all-time favorites! 1 Homemade pie crust my recipe makes 2 crusts, so you can freeze the other crust, or cut the recipe in half. Prepare my perfect pie crust recipe, up to step 9. In a large bowl, combine the sugar, brown sugar, salt, corn syrup, butter, eggs, and vanilla. Next, pour the chopped pecans into the bottom of your unbaked pie crust. Then pour the sugar syrup mixture over the top of the pecans. Bake at 350 for about 50 minutes. After about 30 minutes of cooking, check the pie and as the edges or the crust start to brown, put a large piece of GREASED tinfoil over the top of the pie. (I just spray mine with cooking spray so that the pie filling doesn't stick to it). You will know your pie is finished when you can shake it gently and it is not overly jiggly. If it jiggles a lot when shaking, continue cooking until the center is more set! Bake the pie 1-3 days in advance, allow it to completely cool, then cover and store it in the refrigerator. I like to remove it from the fridge at least one hour before serving.